Blessed with some of the best grape-growing land in New Zealand’s Northland region, The Landing vineyard produces award-winning, sustainable wines. Grown on the coastal slopes overlooking the Bay of Islands, the 2017 Chardonnay delivers citrus, stonefruit and fine oak flavours, with excellent fruit weight and power. Harvested from a mix of Chardonnay clones B95 and 548 that are growing in clay soils at The Landing Vineyard on the Purerua Peninsula in warm growing conditions. The grapes for this single vineyard wine were hand-picked on the 4th, 7th, and 17th of March 2017, at sugar levels between 21 and 23.5 brix. 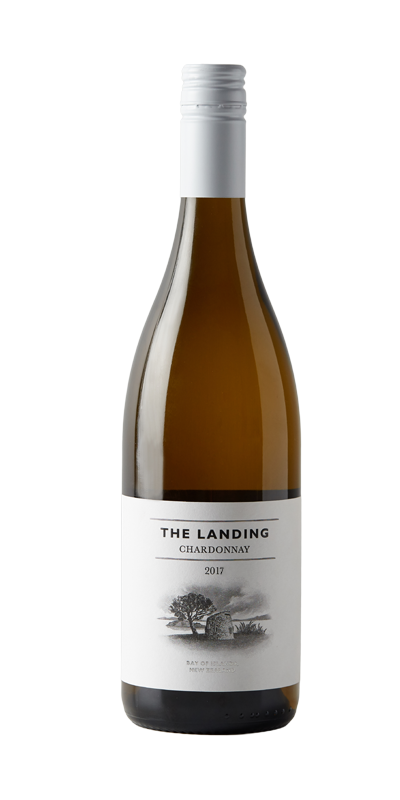 The Landing Chardonnay grapes were 60% de-stemmed; 40% whole bunch pressed and barrel fermented at cool temperatures to preserve the fruit characters. A portion was pressed straight to barrel and allowed to ferment naturally with indigenous yeasts. Approximately 90% of this wine underwent malolactic fermentation(MLF). The wine was matured on fermentation lees in 30% new French oak for 11 months. Bright, light golden-hued yellow colour, a little lighter on the rim. The nose is softly fresh and full, with deep and concentrated aromas of ripe tropical fruit, melon and citrus fruits, along with savoury mealy notes, rich barrel-ferment and nutty oak elements, unfolding a gentle layering of creamy MLF aromas. Medium-full bodied, the palate has good depth of ripe citrus and tropical fruits entwined with yellow stonefruits, complexed by creamy barrel-ferment, nutty oak, savoury mealiness and subtle butterscotch MLF. The mouthfeel is rounded, rich and succulent with some acid liveliness, and the wine carries to a sweet-fruited finish of tropical fruits and nutty oak. This is a ripe, sweet tropical and citrus-fruited Chardonnay with creamy and nutty oak, savoury mealy detail on a rich palate. You must be aged 18 or over to enter this site. *New Zealand law requires that you be 18 years of age or older to purchase alcohol.